Lena Campbell is working on a digital photo story as I enter the classroom. It shows mostly young men in her family circle and the backing track is an original rap by her son. It’s called “Runamucks”. The photos are captioned: the word “gangsta” crops up frequently. So does “RIP” after the names of some of the men. There are photos of guns, police, handcuffed prisoners. In an unsettling photo one of the young men, who elsewhere I have seen with his arms around his mates’ or his girlfriend’s shoulders, brandishes a huge knife. Lena (at right) is doing a course through Batchelor Institute known as “Digilinks”. She’s literate and thoroughly articulate in English, while her mother tongue is Ngarrindjeri (her grandfather was an Arrernte Campbell who married a South Australian woman). She uses an iPad and its various apps including Studio Art with confidence. This was the sort of thing I had come to find out but it immediately seems rather trivial alongside what she wants to talk about: her sons. She tells me about her rapper son. He lost his father at a young age, he was depressed and suicidal, he got into a big gang here in Alice but now he’s found music: “This is how he expresses himself. He’s come out of the cycle.” She would love to see him go further with his music, “to sing for a living”. Her first-born son, “Buddha”, was not so lucky. 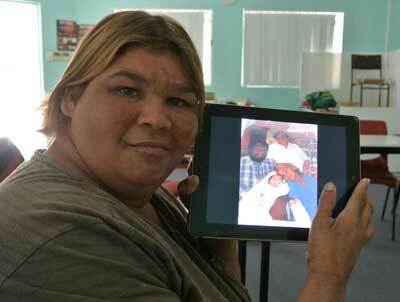 “He passed away,” she says quietly, “he was murdered.” He was in a gang in Adelaide. She shows me another digital photo story done in his memory. He was the young man with the big knife, just 20 years old when he died. One of her captions under a photo of him reads, “Love all my family from da Heavens”. She wants young men to look at these stories and start thinking about making different choices in their lives. But the stories are also for her, “to help me get over grieving”. The course has been “awesome” for this: “I’m learning to express myself”. It feels like the start of something: “I’d like to work on other subjects,” she says. Although the 12-week course ends next week, there’s a strong case for some students to be able to return, says teacher Angela Harrison. She and her colleague Miranda Mills are employed by Batchelor which in turn is funded by FaHCSIA to deliver this course, mostly to local CDEP participants. Batchelor typically works with remote area students on its campus south of the Gap. But the old Bloomfield Street campus is more accessible for Alice residents, says Angela. A visitor arrives, Carmel Barry, a nurse working for a home visiting program for mothers of young children, run by Congress. She’s organising a Christmas party for them. 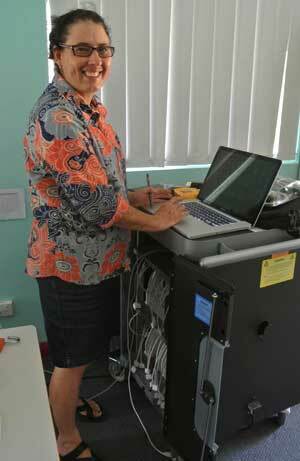 Sylvia Drover is one of her clients and also a Digilinks student. She says she’ll come and bring some of her family with her. She’s working on a digital photo story of her family, starting with her very cute chubby-cheeked baby, dressed all in pink. There’s another photo of the baby swaddled in white, in her father’s arms with a big sister leaning in. The family live at Warlpiri Camp. That’s exactly what Sylvia (at left) wants: “I need to learn more, to read and write, to do more things on computers.” She shows me a story that’s she’s already completed. It’s called “Sacred Sights”. There are photos and some video of the “dog dreaming” sites around Anzac Hill and Charles Creek as well as of the plaques on the Anzac Hill obelisk, recalling the various wars in which Australia has been involved. Her fellow students can be seen in a number of the shots. Coming to the class “makes me feel happy”, says Sylvia, “and it gets me out of the house.” She turns back to her iPad and chooses another folder of photos. I had been touched to see her happy young family, but now I get the bigger picture. These photos are all of graves, the graves of people related to her. There’s her mother, “62 years old when she left me”, there are uncles, an aunt, and then there are children – a five-year-old boy hit by a car, an eight-year-old girl who died of cancer, a 15-year-old girl who killed herself, a six month old baby who suffocated, two little girls who were burned in a car fire. “Memorials” have emerged as a bit of a theme for the class, says Miranda. What they focus on in their work is “student-driven” and they visited the cemetery as a group. Sylvia is matter-of-fact as she shows me these images but soon turns back to working on her happy family story. After this course, she’d like to learn about sewing, she says. Not all of the students are mothers. Angela shows me the work of a couple of young single adults. A young man is working on an animation, using plasticene figures that he’s modelled and a tiny stage set that he’s made and rigged up lighting for. Angela is looking to put him in touch with a professional animator to go further in this field. His cousin has taken the opportunity to research her family. She visited the Strehlow Research Centre and obtained genealogies recorded by Ted Strehlow as well as early photos of her forbears. She used the Western Arrernte Picture Dictionary, which includes good maps, to help her decipher the Strehlow orthography and match it to contemporary spellings of place names so that she can trace where her ancestors were born and lived. Next step for her might be Batchelor’s “Preparation for Tertiary Success” course, says Angela, but they have also discussed the possibility of her pursuing a creative media course with a focus on production. “She’s very organised,” says Angela, “and interested in community development.” There’s a little used learning centre on Ilparpa town camp where the young woman lives. What would it take to get that going again, she’s been wondering, similar to the way the learning centre at Larapinta Valley Town Camp operates? At right: Teacher Angela Harrison with the “tea trolley”, a useful tool. It can charge all the iPads and back up all their content all at the same time. As students go along in the course, the teachers talk with them about where to from here. Some are ready to start looking for work and doing a job application with them or visiting a potential workplace can be useful. Some might need another course or some further training before they’re ready for that. Carmel recalls a student who went on to do Karen Sheldon’s hospitality training at the IAD cafe and then she got a job. Angela helped another student link up with a research project on which she was then engaged as a local researcher. Critical to students making progress is to connect with their aspirations, says Angela, and to be flexible enough to find ways for them to come back in when life – illness, family dramas, drinking – gets in the way. The iPads are the tools for today’s literacy acquisition. Learning with them goes hand in hand with using communications media, like mobile phones, the Internet and Facebook. None of this is an end in itself, but a means to an end – taking the next step. Note: Batchelor Institute of Indigenous Tertiary Education has two main campuses, one at Batchelor in the Top End, and one in Alice Springs at the Desert Knowledge Precinct on the Stuart Highway south of Heavitree Gap. Before the DK Precinct was built the Alice campus was on Bloomfield Street, just across the highway from the Alice Springs CBD. An important uplifting article. We need more such articles that inform the public, and critique the delivery of foundational courses at Batchelor. For many people courses such as ‘Digilinks’ could be the beginning of a whole new perspective on life as in the case of Lena Campbell. Angela Harrison and her team are to be applauded. Excellent article – well done Digilinks! Yes, it’s great. Please write more like this. 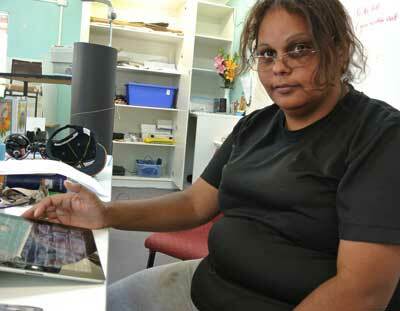 Batchelor Institute is proud to be working with such amazing Central Australian people. We know we are living up to our vision of “Strengthening Identity,Transforming Lives and Achieving Successs” when we can offer such programs to our clients.